Home Inns & Hotels Management (NAS: HMIN) reported earnings on Thursday. Here are the numbers you need to know. 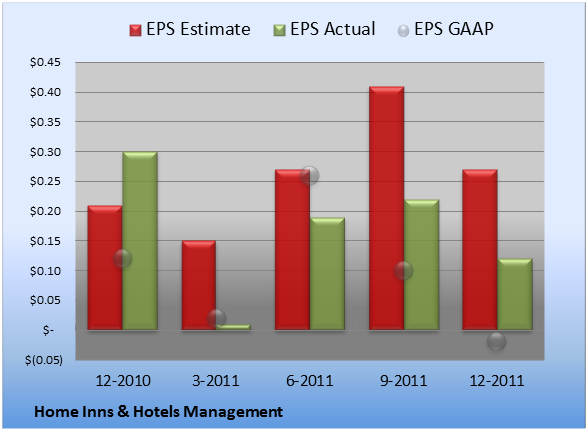 For the quarter ended Dec. 31 (Q4), Home Inns & Hotels Management missed slightly on revenues and missed estimates on earnings per share. Compared to the prior-year quarter, revenue expanded significantly, and GAAP earnings per share dropped to a loss. 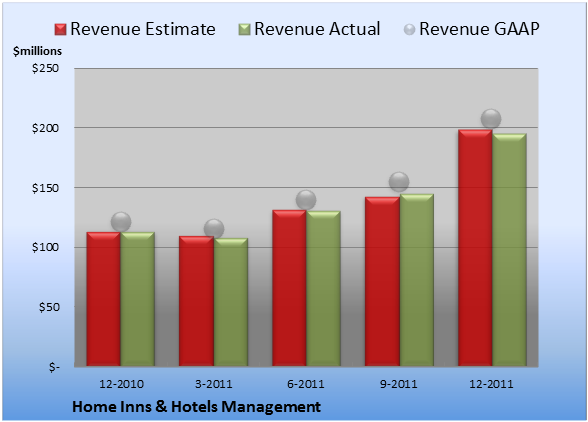 Home Inns & Hotels Management logged revenue of $195.2 million. The six analysts polled by S&P Capital IQ predicted a top line of $198.6 million on the same basis. GAAP reported sales were 72% higher than the prior-year quarter's $121 million. Non-GAAP EPS came in at $0.12. The five earnings estimates compiled by S&P Capital IQ predicted $0.27 per share on the same basis. GAAP EPS were -$0.02 for Q4 against $0.12 per share for the prior-year quarter. For the quarter, gross margin was 30.3%, 710 basis points worse than the prior-year quarter. Operating margin was 4.5%, 810 basis points worse than the prior-year quarter. Net margin was 2.5%, 160 basis points worse than the prior-year quarter. Next quarter's average estimate for revenue is $174.7 million. On the bottom line, the average EPS estimate is -$0.03. Next year's average estimate for revenue is $855.6 million. The average EPS estimate is $0.77. The stock has a two-star rating (out of five) at Motley Fool CAPS, with 479 members rating the stock outperform, and 65 members rating it underperform. Among 145 CAPS All-Star picks (recommendations by the highest-ranked CAPS members), 119 give Home Inns & Hotels Management a green thumbs-up, and 26 give it a red thumbs-down. Of Wall Street recommendations tracked by S&P Capital IQ, the average opinion on Home Inns & Hotels Management is outperform, with an average price target of $43.74. Over the decades, small-cap stocks like Home Inns & Hotels Management have provided market-beating returns, provided they're value-priced and have solid businesses. Read about a pair of companies with a lock on their markets in "Too Small to Fail: Two Small Caps the Government Won't Let Go Broke." Click here for instant access to this free report. Add Home Inns & Hotels Management to My Watchlist.